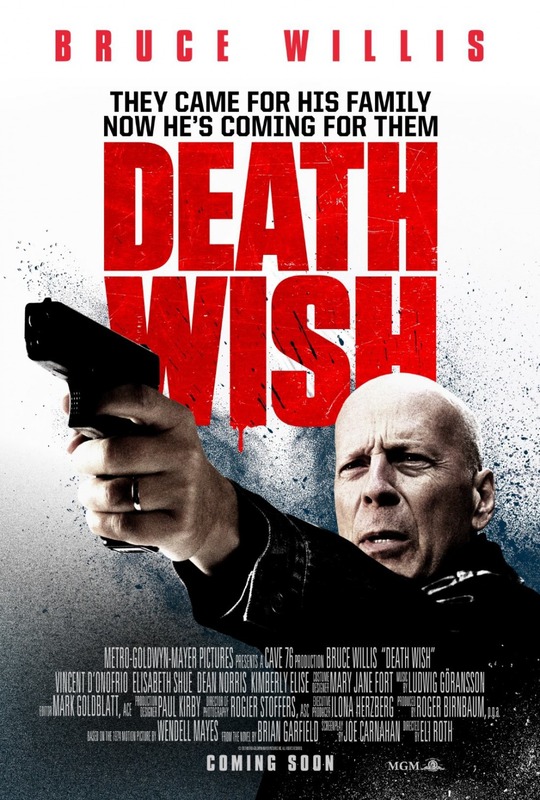 Chrichton's World: Review Death Wish (2018): Bruce Willis actually tried this time! Review Death Wish (2018): Bruce Willis actually tried this time! To jump right in you don't have to worry about this being ome of those " I don't give a damn" Bruce Willis movies. This is more like " I still don't give a damn but I am going to give it more effort because I am enjoying myself a little " Bruce Willis movies. This probably is one of the most decent films he has been in recently. Also to be clear I am not going to compare this to the original since I want to watch it properly first before I say anything. I owe Charles Bronson that much. Although I do have to add that when this remake was announced I was incredibly sceptical. I like Bruce Willis (when he gives a damn) but he sure isn't Charles Bronson. Honestly I was surprised that they picked Bruce to do this. He just isn't the right type.But I have to say I did warm up to the character he plays although there are some problems with the way Willis is acting. He has his " not give a damn face " on all the time. Even in a very pivotal scene where he tells his brother Frank (Vincent D'Onofrio):" look what they did to my baby ". He couldn't even shed a tear. I mean come one Bruce. Only much later towards the end there is a scene where you get some sense of the agony his character has gone through. In essence Death Wish is your basic revenge flick where you know how things are going to play out. For some reason they decided to use famous radio personalities of Chicago to fake discuss vigilantism and the repercussions. At first it seemed like they were going somewhere like it did in The Boondock Saints. But apart from them supporting or disapproving the actions of The Grim Reaper (Willis) nothing is done with the commentary. It's just there to make it seem like this is a political film while it's not. Director Eli Roth is more concerned with the action and violence. Especially the violence. Nothing you haven't seen before although in once scene particular it was very graphic. And in hindsight totally unnecessary. Actually it's one of those moments where I felt no sympathy for Bruce's character at all. Far too excessive and too cold blooded. I think one real problem is that there barely is a depiction of the rampant and violent crime in Chicago. If they had given us more examples and by that I mean show and then have Paul Kersey deal with these criminals it would have been more cathartic. Now you kinda have to tap in your own feelings about crime and how it's dealt with. But what if you live in an area where the worst crime is returning your library book too late? Then it becomes real hard to sympathize with Paul. To give some credit to Roth he does try to make you feel for Paul and the situation he is in. On a surface level that is enough. However if you are craving more than just action and violence there is nothing there. That is a real shame if you ask me. Because it would have been nice if the film would have addressed better or real solutions to crime issues. I guess Vincent D'Onofrio's character was supposed to act as Paul's conscience. But Roth fails to make good use of him. The little dialogue he has is so basic and pointless. In fact he could have been left out of the film and it wouldn't have changed a single thing. That's just all kinds of wrong. If you don't care about politics and you don't need more than your typical vengeance type action you will get more than enough to be satisfied.